Sea-Changers Blog: Tourism can help threatened turtle populations in the Maldives - Richard Aspinall reports. Tourism can help threatened turtle populations in the Maldives - Richard Aspinall reports. There’s nothing like spending time underwater with a reef full of turtles, it’s easy to forget yourself as your scuba cylinders get ever emptier and the turtles eye you cautiously, more interested in dozing and perhaps rubbing against a piece of coral to remove a troubling pest, than they are in one of the many divers that visit them, keen to see the Green Turtles of Kuredhu. To my left the ancient rock that underpins the atoll descends deeper into the channel, the Kandu as the locals call it, and to the right, there are layers of reef. Long shelves of rock and coral, fractured and riven by time. In and amongst this scenery the turtles sleep. Later, in the tropical night they will explore the shallow reefs to graze on sea grass, their primary food source, staying shallow and avoiding with luck, the free-floating discarded fishing gear that ensnares many of their relatives. I’m in the Maldives, on the Lhaviyani Atoll, to the north of the capital Male. It’s the first time I’ve been back in ten years and things have changed. Male is expanding, an influx of foreign investment, mainly from China, has seen the island grow as a lagoon is filled in, to make way for a new airport. An artist’s impression of the capital to come, is rich in glass and steel. I’m reminded of Dubai or Doha and a flier I find in the airport makes it clear that the Maldives is open to investment and development. It’s easy to be despondent about the Maldives’ embrace of mass market tourism and the impact it will have on fragile ecosystems already threatened by coral bleaching events and ocean acidification. A bleaching event in summer 2016 has left many of the reefs of the northern atolls significantly degraded. An increasing number of visitors from south east Asia and the Middle east can of course secure the future of what is still a developing country, but every new resort adds pressure to a country blessed with few natural resources other than islands created and maintained by the living coral. Despondency is commonplace amongst the marine conservation community, yet every so often there are projects that show a better way forward. Take energy for example, Every Maldivian resort I’ve visited has its own diesel-powered generator, tastefully hidden away from tourist view of course, but still present and demanding regular fuelling. The resort I’m staying at, Hurawalhi, is I hope, indicative of a more sustainable future. Solar panels generate roughly thirty five percent of the resort’s electricity consumption and a desalination plant limits the need for that great scourge of the ocean, the disposable plastic water bottle. Discarded water bottles are often seen away from the well-kept tourist beaches and many will have the remains of hermit crabs within them. A sad analogue of lobster pots. But back to turtles. The resort hosts a diving centre, as most do, but what is unique, at least in my experience is the presence of a marine biologist employed by the UK charity, the Manta Trust. The post is funded by the resort and dive centre, and indirectly by the guests. I met Lisa, a young and enthusiastic German by birth, for a trip to snorkel with the manta rays and as we stood on the bow, looking out across the atoll’s central lagoon she told me about how diving tourism was helping wildlife. I had been concerned about the impact sport fishing might have on sharks, and it was Lisa that first told me of the ban on commercial shark fishing, enacted in 2010 and the catch and release policy, when sharks were caught in sport fishing. I still find sport fishing unpleasant but that’s my personal view, I’m not entirely sure the stress placed on sharks during their capture, however brief, won’t have severe impacts upon their health. We chatted about the juvenile blacktip reef sharks, common in the very shallow waters around the island and how you could tell new arrivals to the resort by their reaction to these skittish fish, sheltering from predators in the shallows and how when I first visited the Maldives, shark finning was still commonplace and many tourist shops would sell you a set of shark jaws for a few dollars. Progress has been made and live sharks are worth more than dead ones. Soon enough we spotted mantas, three of them, cruising deep below us. Their two procephalic fins that descend from either side of the mouth to help channel plankton towards their open gapes, were ‘stowed’ and they were not feeding. Getting close would not be possible, I was content to watch them pass us by. We chatted about the turtles. “you can name one if you want.” Lisa said. I looked puzzled. “the greens have unique markings on the side of their heads, so get a picture and if it’s new to us, you get to name it.” In between leading snorkelling trips and dives Lisa is monitoring the local turtle populations, building an idea of numbers. So far, the list shows around 100 Green turtles on the atoll and when I finally send my photos over, GRNew24 is added to the list and becomes: ‘Turtley McTurtleface’, I suspect I should be embarrassed. Around 500 Green turtles have been identified across the Maldives, making the local population regionally significant. The Greens are rarer than their Hawksbill cousins, around 2800 of them have been identified so far. Some resorts have removed their sea grass ‘meadows’ to keep their beaches white with turquoise seas as websites promise, yet these habitats are fascinating and surprisingly useful in trapping sand to protect from storms and to maintain the islands’ structure. On my last day, I hopped aboard a small boat to the nearby Island of Naifaru, a place for locals and not tourists. I wanted to visit the Atoll Marine Centre to understand their work and see their turtle rescue centre. Local islands are, entirely different to tourist islands as you might imagine. Single storey houses and shops and a new school were bustling with activity despite the tropical sun. you can still find older buildings with walls built from coral on occasion and outside houses old plastic containers are filed with plants for colour and vegetables. The conservation centre, staffed by European volunteers and part of a wider community project (Naifaru Juvenile), centres around a series of low, shallow tanks, each holding young turtles. It’s feeding time, so many have been placed in old washing up bowls to feed messily on tuna, before they’re returned to the cleaner water of the main tanks. The team tell the visiting tourists how turtles are kept as pets by some people on the islands, and of course, there are several animals missing flippers from accident or injury. Some turtles are in home-made cradles to keep them buoyant, entanglement with discarded fishing gear and other jetsam has left them unable to dive due to a build-up of gas between their shells and other tissue. Over time every rehabilitated animal will be returned to the ocean. I spend all the money I have on me in the small gift shop and ask them to keep the change. So many of the turtles at the centre are the Olive Ridley species. Olive Ridley turtles spend far more of their time in the open water and are consequently much more likely to become entangled in discarded fishing gear. Several days after my return to the UK, Lisa sent me some images of a massive ghost net ‘conglomerate’ with four Olive Ridley turtles entrapped within it. A sickening sight. 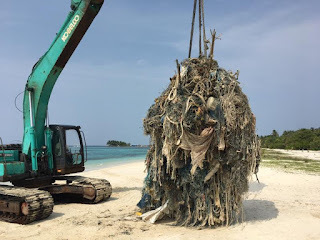 The mass of old net, rope and plastic was brought to shore by the dive centre and disposed of properly, removing a threat that would wander the Indian Ocean for years if not dealt with and the turtles freed and released, but many more similar floating traps remain. Interesting information. I had not even thought about it before. I can also advise a resource paper writer service. Excellent specialists work there. They will help in learning.